Reliability, loyalty, trust & positive energy are what strengthen the bonds between us and our animals. These are the values that this company is founded on, we strive to radiate these throughout the pet & guardian community of Ditmas Park and it’s surrounding neighborhoods. You can rest assured that as fellow Ditmas Park residents and pet guardians ourselves, we are in tune with every detail of our common surroundings (i.e. best walking routes, caution for breaking trees, how to avoid unfriendly dogs outside). Additionally, it is important to us to maintain a neighborly bond with you all, and to uphold the high standards our community expects. We know there is no “one size fits all” when it comes to pet care. Each animal & their daily routine is unique. Our visits are tailored to fit your pet and their needs. We provide our services professionally, but with a personal touch. We are not a huge company, we are not an agency. We choose high quality over quantity, our team will always stay small, personal, and dedicated. With several years of experience working with animals, both full time in the petcare industry and being responsible for pets of our own, we are confident in our methods. We are very serious about maintaining the security of your home, we know how to follow instructions, and we also use our own tried & true expertise to make sure your animals get the most out of their visit. We are Jeffrey & Kena, a husband and wife pet-sitting team residing in Ditmas Park with our two mixed breed dogs (Bambi & Amber), and cat (Layla). We also work with two additional walker/sitters to round out our team and to ensure reliable coverage. Read all of our “bios” below. We both have been dog walking and pet sitting dozens of wonderful pets in the Ditmas Park / Flatbush / Midwood / Kensington area, working nearly every day for the past 5 years. Be it Christmas, a snowstorm, or a early morning downpour… you may have seen us biking or walking around to take care of our furry buddies. We love our neighbors, don’t hesitate to say hello! Kena (pronounced Kay-na) is an all around animal enthusiast. Since childhood, she’s had an affinity for helping animals in need, she has fostered and found forever homes for stray cats, chickens, turtles, and bunnies. With decades of her own pet guardianship as well (including cats, dogs, fish, small mammals, and snakes), she brings a deep understanding of various animals to her work as a caregiver and walker. Kena completed her first successful pet-sitting assignment in 2004, which sparked an interest and a goal to always give pet-guardians a “peace of mind” and pets a “stress-free” experience while the guardians were away. Since then, any animal that she has had the opportunity to care for has received top quality care. Kena has been dog-walking and petsitting full time since 2012, with a constant focus on improving her skills and knowledge of animals. In early 2015, she received certification in Animal Psychology through the accredited institution Holly & Hugo. All the additional education she has obtained, as well as “on the job experience”, combined with her empathetic personality and positive attitude allows her to form true and lasting bonds with the animals she works with. As well as working with animals, Kena also enjoys creating art and music. She is a NYC licensed tattoo artist and painter (www.KaeGabrielle.com). She combines her two inspirations (animals and art) to provide pet-guardians with gorgeous hand-painted portraits of their loved ones. She also enjoys graphic design, and created this awesome website. She grew up in Brooklyn (Park Slope and Flatbush) and is currently a proud resident of the Ditmas Park community. 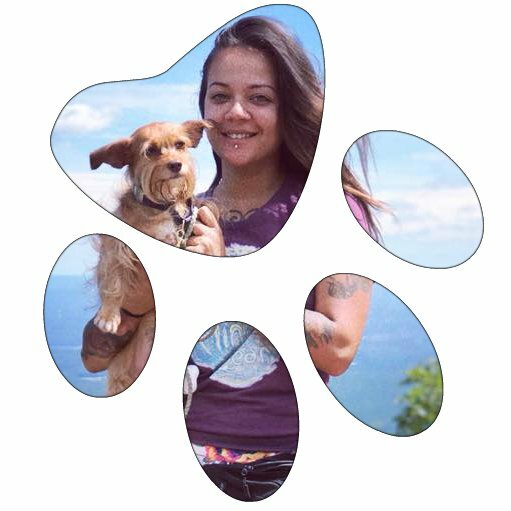 Ash is an experienced pet-care professional who has been dog-walking and pet-sitting in Brooklyn for several years. He is pet first-aid and CPR certified, and lives in Ditmas Park. In 2013 he adopted his beautiful chocolate Labrador (Maisy) and his cat (Xena), and he’s been an awesome “pet-dad” to them over the past 5 years. No inclement weather can phase him, as he thoroughly enjoys the outdoors. whether camping & hiking upstate, or just taking his pups to Prospect Park (Maisy and her best friend Amber are avid swimmers and love to spend hours at the “dog beach”), he’s in his element while outside with his favorite dogs. His adoration for all animals is undeniable and every pet he works with can immediately sense his love and dedication to them. And, as an added bonus– his care and compassion are not just limited to animals, Ash is also a certified EMT. Rusa has been a lover of fur friends all her life. As an only child, she was raised with 2 German Shepherds (one of them taught her to walk), 3 cats and 2 goldfish. Her mother also had a habit of taking in strays, which impressed upon her the importance of looking out for fur friends in need that has stayed with her all her life. Her first pet sitting gig was back in college while living in the East Village. Throughout the years, she’s always looked out for the fur kids of friends and family. She has always had a cat in her life until moving back to NYC 10 years ago. Instead, she has been happy to live vicariously through others by pet sitting on the side during that time. She very much enjoys working for Ditmas Paws, truly appreciates building relationships with new fur friends and working in her community. In her spare time, she works on community building/healing projects, loves to play pool, watch great films and make the perfect mix. Mary-Elizabeth has always adored working with animals. Growing up she took care of the pets of family friends and neighbors, and continued her dog walking and pet/house-sitting work as an adult. She was a pet parent for 10 years to a beautiful rescue cat named Red who followed her from one residence to another in Oregon, Copenhagen, Montreal, and Brooklyn! Languages and communication are a big part of her life and listening to how and what an animal is communicating to a person is something Mary-Elizabeth is tuned into and passionate about. Outside of animal care taking, she is also a music teacher in Brooklyn and Manhattan and highly active playing fiddle in the NYC Irish music scene. Kopyrh (pronounced Copper) is a patient animal lover who grew up in a very pet friendly household. A natural caregiver from a young age, she has been guardian to cats, hamsters, fish, and has a knack for rescuing bunnies. She adopted her first bunny at the age of 9 (Wilbur, he was actually a senior bunny who was the same age as her), and she recently adopted another rabbit (Artemis) and they currently live together in Flatbush, Brooklyn with her 3 cats and a lizard. She brings her lovingly calm and chill energy to your beloved animals, has been dog-walking and pet sitting for other pet guardians since 2012. Kopyrh is also a talented vocalist and seamstress, when she is not working with animals, she enjoys making music and creating clothing and costumes. No More Guesswork or Worrying. When you know your sitter, you trust your sitter. With animals of our own, we needed to create the kind of company WE would feel fully secure in hiring if we needed pet care services. WHY USE A LOCAL PET CARE COMPANY? Large companies that span across the whole city, with lots of employees, are sacrificing quality for quantity. To be able to take more clients and receive more $, they hire frequently and generally have high turn-over rates for their workers (who may be lacking experience and expertise), people just “passing through” and using dog-walking / pet-sitting for a couple months to make a quick buck until “something better” comes along. There is no dedication to you or your animal. That does not allow much opportunity for your pet to bond with their walker/sitter and can result in your pet getting lost in the shuffle, or worse. In addition, using an “on demand” pet service app can seem appealing in terms of convenience– but having strangers access your keys and home can pose safety risks to your pet and security risks to your home. The hiring process for these apps are not carefully selective and require minimal qualifications to “cuddle dogs all day”. In reality our profession entails more than just cuddles. Knowledge of animal health, behavior, safe handling, and home security, are crucial aspects of providing the best possible care to our clients. If you do a quick google search you’ll find that due to these oversights, within the past year alone, in our very own neighborhood several dogs have been lost by inexperienced “walkers” provided by these apps. Please carefully consider the pros & cons before using an “on-demand” app for the care of your furry-family and home. These apps pride themselves on their “Uber”-esque convenience, but would you really want your Uber driver letting himself into your home while you’re out at work?